Lonesome George was a living icon for world conservation until his passing on June 24, 2012. In captivity, he was cared for like a breathing relic in an isolated tortoise pen at the Charles Darwin Research Station in Santa Cruz Island. 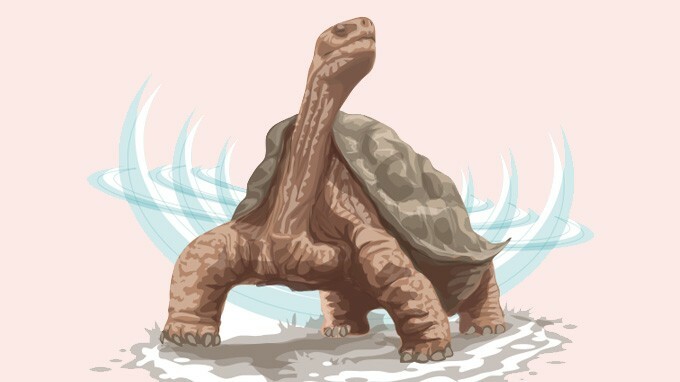 Feared to be the last remnant of his La Pinta Giant Galápagos tortoise subspecies, scientists the world over tirelessly tried coupling him with genetically similar females, hoping to secure his pool for generations to come. All attempts proved unsuccessful. Upon his passing, new information surfaced from leading researchers in the Galápagos Islands, hinting that 17 young giant tortoises show levels of kinship with George’s subspecies, and that perhaps a pure La Pinta tortoise breed still roams Isabela Island (carried there, one supposes, by pirates or settlers). This possibility would have been even more exciting during Mr. Lonesome lifetime, although he is certainly in everyone’s hearts and minds as hope remains to save the ‘Pinta’ from extinction. So much has certainly been said about Lonesome George’s, let’s call it, ‘shy approach to women’, which made the project of reproducing La Pinta tortoise DNA so painstakingly difficult… On the other hand, so little has been said of Super Diego. The Santa Cruz II ensure sumptuous surroundings from which to take in the magnificent vistas of the Galapagos Islands.